WARNING: THE FOLLOWING POST IS A LISTICLE. IF YOU ARE SENSITIVE TO LISTICLES, STOP READING IMMEDIATELY AND WALK AWAY FROM THE COMPUTER. It’s been 1 year, 11 months, and 2 weeks since Benn first moved on to our beloved narrowboat Lilebelle, and now we are finally passing her on. There was a lot we loved about that boat, but at 40 ft she was a bit small for a husky and two people who work from home. More importantly, in a narrowboat, you are pretty much limited to touring the English canal system, which is lovely, but not quite as adventurous as the seven seas. Narrowboating, however, was our introduction to the liveaboard lifestyle, and we will be ever thankful to Lilebelle for showing us the way. 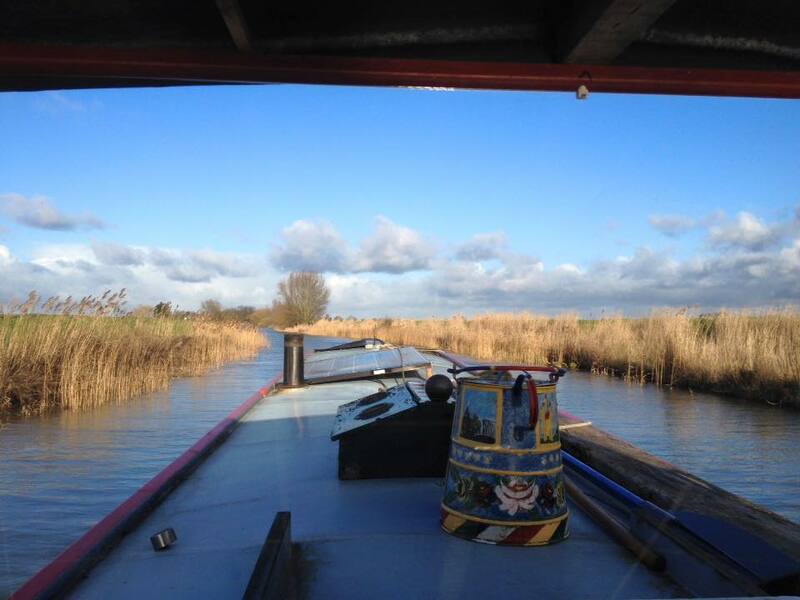 In her honor, we’re sharing a few things she’s taught us about living aboard a narrowboat. 1) Use your boat. So many people move onto narrowboats because they’re more economical than living in a house or flat — and, when the average monthly rent in London is 1543 GBP, there’s a good reason to be economical. However, there are a few things you give up by living on a boat: working plumbing, bathtubs, storage space, the ability to stretch your arms out without touching both sides of your living room walls. There has to be some compensation for all of that, and the compensation is the incredible freedom you feel when using your boat. Nothing can compare to sliding up and down the glassy rivers and canals, through wildlife reserves, beneath ancient bridges, past fields and fens, only to end up spending the night in a beautiful medieval harbor or outside of your favorite pub. Without all that, you’re living in a floating caravan. 2) Remember that you’re on a boat, not a tank or a sports car. A narrowboat might not be as difficult to handle as a sailboat, but it’s not a car, either. In all things, proceed with caution and care, think about other boaters, go slowly, and, for Godsakes, don’t assume that because you are driving a steel megalith you can plow into other boats, harbor walls, and river banks without harming yourself or others. Obey the rules of the waterways (drive on the right side, American style, except, for some reason, in the city of Cambridge). Lay off the drink. Slow down when passing marinas or moorings. Try not to lose your temper when the plastic gin palaces try to run you down or the rowers forget to look where they’re going and scratch your paintwork. 3) Stow your stuff. Sailboats have all sorts of ingenious places to stow your possessions. Narrowboats, on the other hand, often seem to be outfitted like flats, ignoring the fact that, in a small space, every nook and cranny counts. When you’re motoring, stuff will fly off of countertops — especially kettles boiling on the hob. Be careful and use your space well — cups and pans can be hung, utensils can be stuck on magnet strips, steps can double as drawers, and every bit of furniture should have space for stowing gear beneath. 4) Choose the right layout. For some reason, newer narrowboats seem to have ginormous galleys. Unless you love cooking more than anything in the world, this is totally unnecessary. Save the room for living, sleeping, or working space. Most sailboats have tiny galleys in order to reserve the maximum space possible for the actual boating part — which is, after all, the point. We’ve also found that it’s best to locate your bed on the opposite side of the boat from which you enter. It just seems nicer that way. Lilebelle lurking in the bushes. There are advantages to not having a flashy paint job. 5) Learn your boat inside and out. One reason why boats have such a reputation for being expensive is because people fail to maintain their boats in the way they should. Narrowboats don’t really require more maintenance than a house — it’s just that they require a different kind of maintenance, one that most people aren’t used to thinking about. So, get to know your engine and how to fix it. Empty the bilge regularly. Install a volt meter and pay attention to your batteries. Fix sketchy wiring before it catches on fire. And learn how to do these things yourself. Cheaply. 6) Be self-sufficient. There is this sort of off-the-grid mentality that is one of the most empowering/ most pretentiously self-righteous parts of narrowboating. Just embrace it. Outfit your boat with solar panels and LED lights(although you can skip the wind generators for the moment – they don’t seem to do as much as they promise to). Use the decks and roof to grow vegetables (just don’t let it get in the way of little, insignificant things like ropes, cleats, and hatches). Try to circumvent mooring regulations and taxes at every turn and justify it by quoting the Magna Carta. Just kidding, don’t do that. It’s annoying. 7) Use your boat. Even in winter. Even when it rains. This is really the most important thing. A chilly January night. To answer the most common question about narrowboat living: yes, it gets cold. This is just some general advice. There’s a lot more specific stuff we could talk about and maybe we will on future occasions. After all, things like engine repairs, wiring, and basic knots are similar on narrowboats and sailboats. For now, so long to Lilebelle and thanks for all the fish. On to Pas de Deux! This was great. Makes me want to move onto a boat…without my children, so something to consider when they grow up. Keep’em coming. You are welcome to visit anytime – kids or not! Why buy a pied à terre in a glamorous, cosmopolitan city when you can own your very own pied l’eau? This is a blog about testing the waters, swimming not sinking, venturing into terra incognita, and pretty much every other maritime cliché to be found on the seven seas.